My overall reaction to Conviction is similar to what I felt about Vortex, and it echoes what others have said about this book, as well. On the one hand, standing purely on its own terms, Conviction has solid writing, good characterization, and some classic Allston hilarity. On the other hand, Conviction is seriously dragged down by the weakness and defects in the story design of the Fate of the Jedi series as a whole. Because Conviction is part of a series that refused to allow each book to stand as an individual story, it’s simply not possible to separate out the review of Conviction as a book from its part in the series. For the second time in the series, the front and back covers of the book both feature female characters. This time, it’s Tahiri Veila on the front and Tenel Ka on the back. Unfortunately, their presences on the cover do not signify important roles in the actual book itself. Like spectral Mara Jade Skywalker on the back of Abyss, Tenel Ka appears in only a handful of scenes, and in most of those she is observed from a distance. Tahiri has a limited number of significant scenes, but it just seems odd to devote limited cover art slots to characters with such minor roles in the series. If I had to venture a guess, Tenel Ka was the only recognizable character with less page time than Tahiri, so they went with her. In other words, don’t get too excited about Boba Fett backing up the next book in the series. It is also worth noting something odd about the dust jacket description for the novel, which had been previously released as a marketing blurb for the book. For the prior books in this series, as well as Legacy of the Force before that (if not longer), the blurbs have recapped what has already occurred, setting the stage for what will transpire during the novel. With Conviction, however, the blurb discusses plot points that occur during the book – actually, not until midway through the book. In and of itself, that isn’t problematic, but it does mark a jarring contrast to the typical manner in which Del Rey has written the blurbs – including the blurb for the next book in the FotJ series, Ascension. In light of all of the other lapses in quality control that have slipped through in recent Star Wars titles, I can only wonder if this is yet another example of sloppy inconsistency on the part of Del Rey. Considering the coup is one of the key events in this book, around which all the action on Coruscant transpires, I fail to see the logic in giving up that spoiler before the reader even turns the first page. 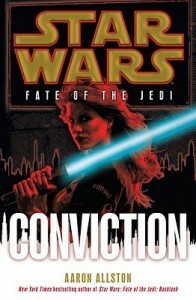 Conviction reaffirms Aaron Allston’s place as a good Star Wars writer. His previous FotJ novel, Backlash, had been written while he was recovering from a near-fatal heart attack, and he understandably was not at the top of his writing game for that book. In Conviction, Allston’s craft is back on par with his previous series work, such as Outcast, Fury, and Exile. His prose is crisp and clear, and fun to read. There’s plenty of good Allston humor, from the sly wink or terrible pun to the laugh-out-loud comedic. At times the point-of-view will have a blip or a head-jump, but Allston has never worried about robotic precision in that area. The quality control is also high, with a text that is mostly error-free. As mentioned above, Conviction is a fun book, but it suffers greatly from the deep flaws embedded in the poor story design of the FotJ series. Most importantly, the overarching plots of the series have simply been developing far too slowly. At this point, it has become clear that the authors and editors had about a trilogy’s worth of material, yet they’ve been attempting to stretch it out over nine books. The result, for the reader, is a story moving at a glacial pace. The other thing that has become clear to me as a reader is that Allston wanted to tell a different story than his two fellow authors. From the start in Outcast, this series opened promising a completely different tone – and a much lighter one, at that – with strong indications that the EU books might actually allow different characters to finally take center stage. Of course that hasn’t happened, and what plays out throughout the series is Allston’s vision for plot, characterization, and flow standing at odds with the rest of the team’s. Conviction itself illustrates this problem well. The only major plot shifts in this book are the coup that overthrows Daala and the guilty verdict in Tahiri’s trial. Allston’s Natasi Daala and Wynn Dorvan, the central characters of the politics arc, are not at all consistent with Denning’s and Golden’s versions. Sure, Daala’s a bit maniacal, but Allston embraces her villainess ways as a Star Wars author should. You don’t need a flowchart explaining the rationalizations and inner workings of her psyche; and remarkably the conceit is quite effective. On the other hand, Tahiri is a character Allston has been trying to do more with from Outcast. In that book, she played an active role as a force for good, while struggling with a way to reconcile all that she had done wrong in her life. Having Tahiri arrested for Pelleaon’s murder wasn’t a bad storytelling choice – but it was to have her trial played out over several books where she throws her lot into the hands of several indiscernible lawyers, then tossing all that away in a hastily rendered verdict. Allston actually does some really brilliant things with Tahiri’s character development, but it’s all lost in the jumble that the series creates. As for the other plotlines, there is no progression in the anti-slavery uprisings plotline. The Lecersen-Treen conspiracy is back after having vanished for two books, but then nothing comes of it other than the reminder that it’s there, lurking in the background. A new reporter is introduced to facilitate the Horn kids’ plotline, yet it just leaves the reader wondering why, if a reporter was still needed, the authors didn’t just keep the well-liked Mahdi Vaandt around? Worst of all, given that the main arc of this series is the Luke/Ben odyssey, the pursuit of Abeloth is just a replay of what we’ve seen before. As in Vortex, he pursues her to another planet, tracks her down among a Force sect there, fights her, and then is forced by the situation to end the confrontation before being able to defeat her. The visit to the planet of Nam Chorios is pointless, except to revisit yet another world from Luke’s past (from Planet of Twilight no less, a book many fans would prefer to forget). Allston does his best with the piece of the story that it’s his turn to tell, but the elements he’s given are so weak there’s honestly very little he can do to turn the story into a success. The biggest strength Allston brings to the table is his ability to clearly portray what he envisions for each character. His POVs are incisive, unapologetic, and brilliantly aware that Star Wars characters must reflect the melodramatic camp necessary for space opera. When he needs a new character, he’s not afraid to make one or two – Dolo Karenzi and Javon Thewles particularly stand out. After a couple of pages, the reader can easily decipher who these new characters are and what their role is within the story. It’s always been easy to trust Allston’s character-building. Turning to the Big Three, Han and Leia have a bigger role than in previous books as they participate in the coup, and there are moments shared between these two that make me wonder why the EU books have been so afraid to create some more solid married couples. The best laugh-out-loud dialogue occurs when the longtime lovebirds share witty retorts, and Allston cleverly uses Han’s and Leia’s intimate knowledge of their partner’s psyche to reveal motivations that might be hidden in a limited POV style. Sadly their role in the story is still hampered by constantly having to deal with young Allana as a third wheel. Although I did appreciate Allston taking a moment to break the fourth wall by having Javon Thewles voice the very concerns many readers have raised about some of the parenting decisions the Solos have made in this series. Similarly, Luke has several great scenes interacting with Ben, Vestara, or both, but too much of his time is spent spinning his wheels in the going-nowhere, gain-another-Force-power-as-we-pursue-Abeloth storyline. Allston does spend some time showing the Jedi Master struggling with the wear and tear of too many battles fought with an aging body, but it’s taken seven books to get there so the effect loses some of the inherent drama we expect from Star Wars. In my past four EU book reviews I felt the need to break out subsections to discuss where I felt the books lacked clear direction as Star Wars franchise offerings and in the equal treatment of female characters. I can give unreserved praise to Allston for his ability to capture Star Wars’ essence and for a noticeable improvement in the characterizations of women. Leia – Literally the best moment in the book is letting Leia quickly and effortlessly strike down a Lost Tribe agent trying to kill Allana – then ending the scene with the decapitated Sith’s internal monologue description of his own death. Tahiri – Her criminal trial ends with an extraordinarily anticlimactic whimper, especially given that readers have watched this courtroom drama drag out over four books. Her subsequent escape from prison marks a change from her recent fatalistic attitude. If you put aside the horrible stalling tactic that was the Pelleaon murder trial, there is some long-overdue character development for the former Sith, especially her decision to save herself rather than rot in prison awaiting execution. She also gets a brief but meaningful scene at the end, where she chooses to turn to love and family for support rather than striking off on her own to live in exile. Jaina – Allston once again proves he is the best of the post-NJO authors at writing Jaina, portraying her as a woman who’s not just strong as a Jedi, but as a person, too. We see her happy with her fiancé Jag and taking a lead role in the action sequences of the coup. There’s also a significant scene with a recovering Luke at the end which, although brief, showcases her insight and wisdom – and the respect and esteem Luke gives her. Unfortunately the Jaina/Jag scenes, while well-written, are just token reminders that seem to be meant to appease fans unhappy with the developments for that couple in Allies. The series was so horribly flawed in its story design surrounding the pair that it seems the best they can do is remind fans that Jaina and Jag will be happy despite the uncertainty of the future. Sadly, the fans knew that already, and I think it’s past time to see the comfortable partnership we witness from Han and Leia in this book. I can’t really fault Allston – he did don that Team Jagged badge at Celebration V without hesitation – but the scenes just highlight how Allston’s portrayal of these characters in Outcast ran so counter to what the rest of the team wanted to do with the series. Allana – For once the little Solo heiress didn’t come off as bratty and worthy of a permanent time-out. In fact, her portrayal was so starkly different from what we got in Backlash I wonder if the same person actually wrote her. It would have been nice to see more of her mother Tenel Ka, but then again at least her fans are getting covers. Daala – Even Daala gets a stronger, fiercer portrayal than in previous books, no longer wallowing in self-pity but displaying deviousness and resourcefulness to get herself broken out of prison. Seha Dorvald – Thank the Maker Allston knows how to take a character and run with it. Seha, a young Jedi Knight, is bold and scrappy and most importantly relatable. Longtime Star Wars EU fans will know the little tidbits of her backstory that makes her compelling, and if not, she’s still captivating in her own right within the pages of this book. And not that we need romance to like a character, but it certainly doesn’t hurt when we’re talking about Star Wars, where supposedly love can ignite the stars. We get some great little flirtatious moments between Seha and Javon Thewles, a member of GA Security whose integrity leads to his dismissal and a subsequent joining up with the Solos. 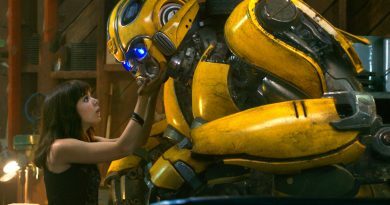 After the sickly saccharine quality of too many of the scenes with teenaged Ben and Vestara, it’s refreshing to see actual, mature romance for a change. Vestara – I can’t say much about the Sith-turning-whatever-she’ll-be character. She’s been portrayed three different ways by three different authors. At least in this book I felt less inclined to dislike her. I’m not sure that’s saying much, but Allston does manage to keep her from wandering into that gag-me-with-a-lightsaber self-involved Bella Swan treatment she’s received in some of the books. If you like Fate of the Jedi so far, you’ll like this book. If you stand somewhere outside that zone, but you like Allston, then you have a choice to make – do you want a laugh-out-loud funny book that doesn’t really go anywhere? If that suits your bill, buy this book – or if you just want to show your mad love for Allston, buy this book. For people who have stayed away from Fate of the Jedi and were hoping the new exciting “mini-trilogy” would turn things around, it’s still too early to say. Conviction is a difficult book to assess because of these two starkly contrasting elements. It’s like getting a brownie sundae with tons of hot fudge swirled on top to mask the stale brownie and melty ice cream underneath. As a fun Allston book, it’s an 8.5; for the Fate of the Jedi flaws, it’s a 4. I like Allston, so I’ll give the individual book score double weight.